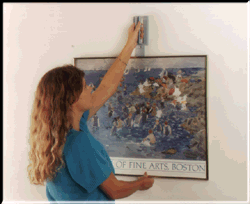 Here's the problem: Almost all pictures, plaques, frames and other art work is hung on a wall using a wire or hanger that is behind the frame. How do you know where to place the hanging nail so that your picture hangs straight, and is aligned on the wall where you want it? You could guess. . . You could try again and again while making multiple nail holes in your wall. . . Or, you could use the Picture Plumb® and get perfect results in three easy steps! With the picture facing you, hook it in the center for balance. Lift the picture and position it exactly where you want it. Tapping the top of the picture frame marks exactly where to drive the hanger nail. 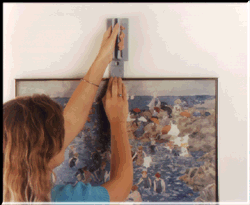 Picture Plumb works equally well with pictures hung with a wire, D-rings, as well as frames with multiple (side) mounting points. 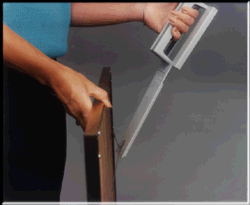 The Picture Plumb tool can accommodate any style screw, nail or picture hanger!